In July 2007, we spent a fortnight in California and Oregon, and attended the wedding of one of our sons in Portland. We flew into San Francisco, hired a car, and travelled gently to Portland, stopping at Napa (in the Sonoma Valley wine area), Sonora (in the goldfields country), Reno (it seemed a good idea), and Prospect (near Cradle Lake). The trip back was faster, with just one overnight stop. Then three days in San Francisco, and back home. 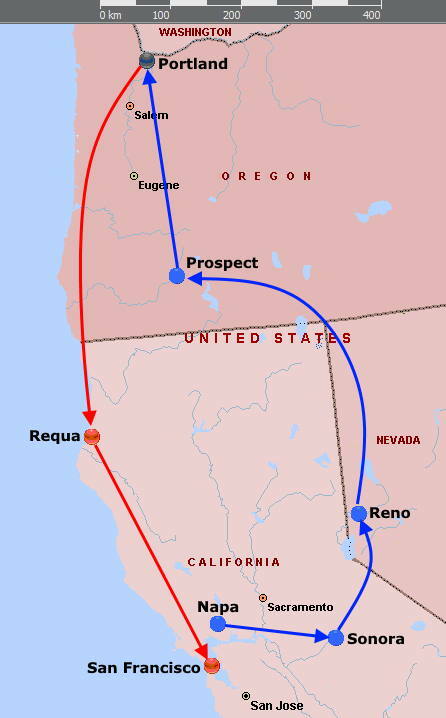 The map shows the trip north in blue, and the trip south in red. Click here for photos taken going north. All photographs copyright © 2007 by Lynn or Nick Booth. No reproduction without written permission.